2012 Book A Fortnight Summary & Happy New Year! Happy New Year 2013. Remember my Book A Fortnight Challenge? Well not only did I complete it, I killed it! The goal was to read 26 books in the 52 weeks that were 2012 which ends up being a book a fortnight (a fortnight being 2 weeks). My final count for the year? 43 books read! That means that I read approximately 80% of a book each week (on average) throughout the course of the year! I have the full list of books read below but I didn’t include a 44th book I read – Ender’s Game by Orson Scott Card – because I have read it a bunch of times before so wasn’t sure it should be included in the final tally. I have organized the below in my own categories and subcategories. I have grouped together some books by series and kept books by the same author close to each other. As well, the links I have provided for the books – for anyone who wants to read them themselves – link mostly to the Toronto Public Library. Without the Toronto Public Library this would have been an extremely expensive challenge and so I encourage anyone reading this who lives in Toronto to check them out (the library system as well as the books from the library). 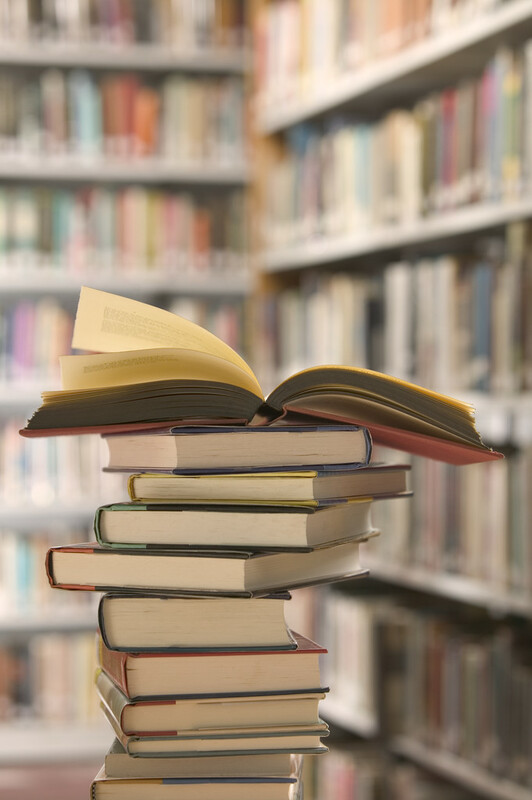 It is so simple to do that you don’t even have to go browse to find books anymore! Assuming you already have a library card/account just go to the link (or search the library site yourself), click “Place A Hold,” tell the system where you want the book to be held for you, and then just wait for them to email/call you (your choice) and go pick up the book(s) on a special hold shelf. Done! In and out of the actual, physical library in under 5 minutes! 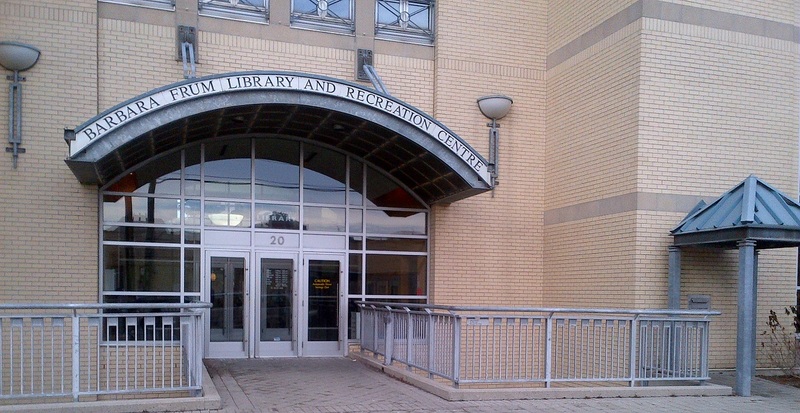 When I was writing the blog post about the Barbara Frum Library the other day I didn’t feel as if I was really getting across the way it was set up with the picture I had attached so I decided when I went back I would get a better picture and explain it all better. To give you a point of reference the picture in the previous post was taken from the left hand side of this picture looking toward the librarian/clerk desk from across the room. As well, I looked to see if there was any large and prominent signage indicating where everything was and there absolutely was not anything of the sort. The closest thing to signage was right above the actual return slot there was an 8×11 piece of paper hung horizontally with the word RETURNS in a large font. Because of the pillars and the size of this sheet of paper ir was completely invisible from the front doors of the library which is the point where any rational person is most likely to be looking for the returns slot. Purple Arrow Entrance guarded by RFID detectors like you see in stores. Red Arrows (Left) 2 self checkout stations. (Right) 1 self checkout station. Green Arrow Librarian and clerk desk. Blue Arrow Badly signed return slot. 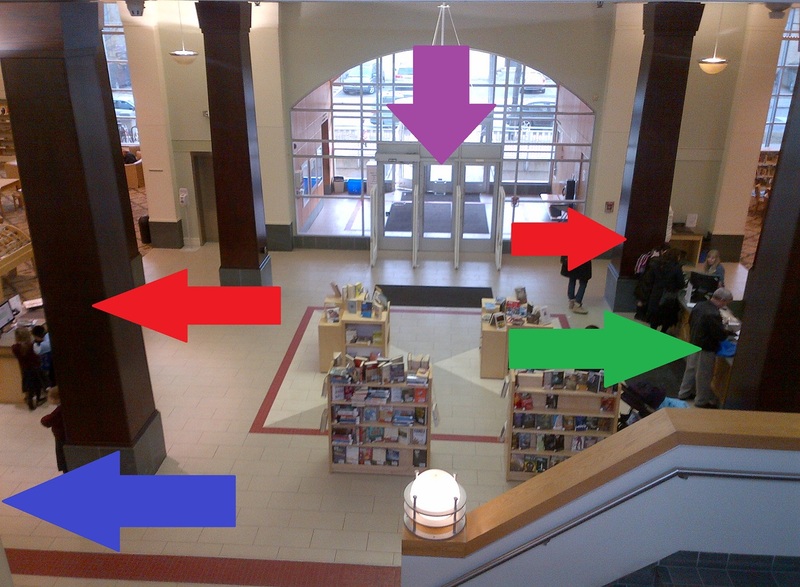 Hope that gives you a better understanding of the remodeled main floor of the Barbara Frum Branch of the Toronto Public Library. 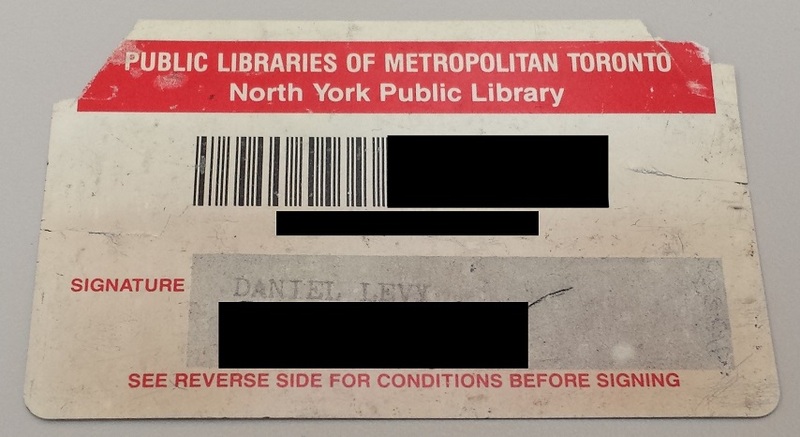 You probably remember my mentions of my return to the Toronto Public Library (and using it) as of late. 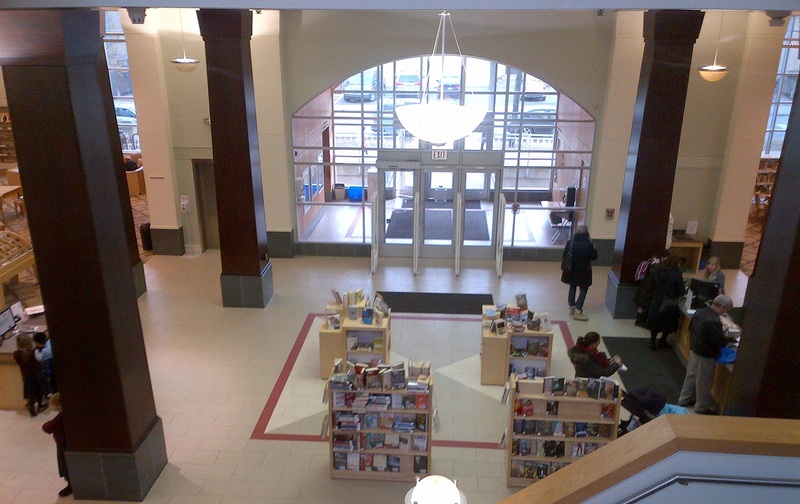 I walked in to the Barbara Frum branch of the Toronto Public Library, the branch I have used since the early 90s when they opened it at Bathurst and Lawrence, the other day to pick up my books and was stunned to see how drastically the front area inside had changed. Gone was the giant desk that had dominated the central area in front of the entrance. In its place were some recommended books on tables sort of like you see in a book store. There were ‘shoplifter detectors’ at all the entry/exit doors which they put in to replace the turnstiles that we encountered in the old set up where we were funneled around the front desk – east side in and west side out.